Libby was a CCB research biologist and our chief operating officer from 2007 to 2015. Her research at CCB focused on the conservation and management of raptor populations in the Chesapeake Bay, Atlantic flyway, and beyond. 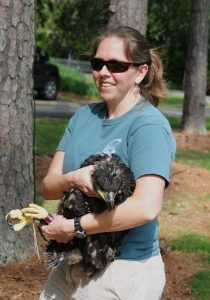 She conducted research projects on Bald Eagles, Golden Eagles, Peregrine Falcons, Ospreys, and Crowned Solitary Eagles. She also coordinated the OspreyWatch citizen science program, was our transmitter specialist, and helped plan and implement new tracking programs on raptors, shorebirds, and waterbirds. Libby continues to volunteer and collaborate with CCB on various research projects. Murphy, R. K., E. K. Mojica, J. F. Dwyer, G. D. McPherron, M. M., Wright, R. E. Harness, A. K. Pandey, K. L. Serbousek. 2016. Crippling and Nocturnal Biases in a Study of Sandhill Crane (Grus canadensis) Collisions with a Transmission Line. The Waterbirds Society 39(3):312-317. Murphy, R. K., J. F. Dwyer, E. K. Mojica, M. M. McPherron, and R. E. Harness. 2016. Reactions of Sandhill Cranes Approaching a Marked Transmission Power Line. Journal of Fish and Wildlife Management 7(2):480-489. Boettcher, R. and E. K. Mojica. 2016. First Record of Peregrine Falcon (Falco peregrinus) Ground Nesting Activity on the US Atlantic Coast. Journal of Raptor Research 50:313-315. Mojica, E. K., B. D. Watts, and C. Turrin. 2016. Utilization Probability Map for Migrating Bald Eagles in Northeastern North America: A Tool for Siting Wind Energy Facilities and Other Flight Hazards. PLoS ONE 11(6): e0157807. Watts, B. D. and E. K. Mojica. 2015. Virginia Peregrine Falcon monitoring and management program: Year 2015 report. The Center for Conservation Biology Technical Report Series: ccbtr-15-06. College of William and Mary & Virginia Commonwealth University, Williamsburg, VA. 18 pp. Turrin, C., B. D. Watts, E. K. Mojica. 2015. Landfill use by bald eagles in the Chesapeake Bay region. Journal of Raptor Research 49(3): 239-249. Watts, B. D., E. K. Mojica, and B. J. Paxton. 2015. Seasonal variation in space use by nonbreeding bald eagles within the upper Chesapeake Bay. Journal of Raptor Research 49(3): 250-258. Watts, B. D., Mojica, E. K. and Paxton, B. J. 2015. Using Brownian bridges to assess potential interactions between bald eagles and electrical hazards within the upper Chesapeake Bay. The Journal of Wildlife Management 79:435-445. Mojica, E. K. and B. D. Watts. 2014. Creation of a national registry for bald eagle communal roosts. The Center for Conservation Biology Technical Report Series: ccbtr-14-20. College of William and Mary & Virginia Commonwealth University, Williamsburg, VA. 11 pp. Mojica, E. K., B. D. Watts, and S. M. Padgett. 2014. Virginia Peregrine Falcon monitoring and management program: Year 2014 report. The Center for Conservation Biology Technical Report Series, CCBTR-14-19. College of William and Mary & Virginia Commonwealth University, Williamsburg, VA. 17 pp. Mojica, E.K. and B.D. Watts. 2014. Bald Eagle Telemetry at the Holtwood Redevelopment Project: Final report. Center for Conservation Biology Technical Report Series, CCBTR-14-17. College of William and Mary and Virginia Commonwealth University, Williamsburg, VA. 8pp. Paxton, B. J. and E. K. Mojica. 2014. Bald Eagle Nest Surveys at Naval Support Facility Indian Head, Naval Surface Warfare Center Dahlgren, Naval Air Station Patuxent River, and Blossom Point Research Facility-2014. The Center for Conservation Biology Technical Report Series, CCBTR-14-10. College of William and Mary and Virginia Commonwealth University, Williamsburg, VA. 10 pp. Mojica, E. K. and B. D. Watts. 2014. Bald Eagle Telemetry at the Holtwood Redevelopment Project. The Center for Conservation Biology Technical Report Series, CCBTR-14-01. College of William and Mary & Virginia Commonwealth University, Williamsburg, VA. 13 pp. Watts, B. D., E. K. Mojica, J. T. Paul, and J. J. Pottie. 2014. Recovery of breeding bald eagles on Aberdeen Proving Ground, Maryland. Maryland Birdlife 63: 10-17. Mojica, E.K. and B.D. Watts. 2013. Bald Eagle Nest Surveys at Naval Support Facility Indian Head, Naval Surface Warfare Center Dahlgren, Naval Air Station Patuxent River, and Blossom Point Research Facility . Center for Conservation Biology Technical Report Series, CCBTR-13-09. College of William and Mary and Virginia Commonwealth University, Williamsburg, VA. 10 pp. Mojica, E.K., B.D. Watts. R. Lukei, Jr. 2013. 2013 Chesapeake Bay Osprey Banding. Center for Conservation Biology Technical Report Series, CCBTR-13-08. College of William and Mary and The Virginia Commonwealth University, Williamsburg, VA. 9 pp.